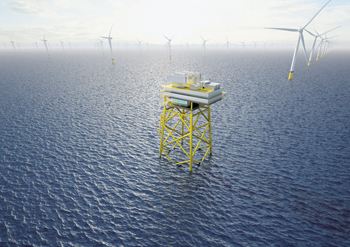 Siemens has introduced a new solution for connecting offshore wind turbines to the grid. Presented at the National Maritime Conference in Bremerhaven, this direct-current technology enables a cost-efficient and simplified connection of offshore wind power plants far from the coast. The platform housing the transmission technology is much smaller and more compact than before. Until now, these plants have been connected to the grid via large central converter platforms. Siemens is now further developing the transmission technology, enabling a large number of much smaller platforms to be built. With the new solution, a direct-current cable can connect several of these platforms sequentially in a wind farm and then route them to an onshore transformer substation. Overall, this solution costs less and is also more efficient than the approach used with conventional platforms. The compact design permits encapsulated high-voltage electrical equipment to be used – especially diode rectifier units (DRUs), which are installed instead of the usual air-insulated transistor modules. The system is also modular and flexible when it comes to installation. The volume of the platform structures is reduced by four-fifths, and the weight is cut by two-thirds. As a result, costs are reduced by more than 30 per cent. At the same time, the new solution enables transmission capacity to be increased by one-third, while transmission losses fall by one-fifth. This is a significant step toward significantly reducing the cost of offshore wind power and making it competitive compared with conventionally generated electricity. “As the only provider on the market, we have already successfully commissioned four offshore direct-current connection projects. Now we are applying our experience directly to the next generation of direct-current grid connections. Our new solution will play a major role in decreasing the cost of offshore wind power below ten cents per kilowatt hour by 2020. This is how we plan to make the direct-current technology used in Germany more interesting to other markets, too,”said Jan Mrosik, CEO of the Energy Management Division at Siemens. A diode rectifier unit has a transmission capacity of 200 MW. Typically, two DRUs are installed on one platform. Up to three of these new platforms can be connected to each other to create an offshore grid node that replaces collection platforms in the wind farms. This link enables a connection to the mainland of multiple offshore wind farms with a total capacity of up to 1,200 MW. The electricity is transported to a grid infeed point on land via cables. A converter station converts the direct current back into alternating current for subsequent transmission and distribution. The land station will also be built by Siemens using a proven design. Thanks to high-voltage direct-current (HVDC) transmission technology, the new system’s transmission losses, including cable losses, are just three percent. Siemens is a leading supplier of HVDC technology. The use of direct-current instead of alternating-current transmission to connect wind farms to the grid is made cost-effective by the new technology for cable lengths of more than about 80 km. The core of the new transmission technology consists of the DRU, the transformer, the smoothing reactor, and the rectifier – all combined in one tank. The use of the DRUs and the encapsulated DC-CS direct-current switchgear decreases the installation space by more than 80 percent compared with air-insulated technology. For the first time, Siemens is using biodegradable ester liquids in the DRU to insulate high-voltage direct-current equipment. Compared with mineral oils, these are not only more environmentally friendly, they are also flame-resistant. The DRU is designed for many years of continuous operation with minimal maintenance requirements. The new technology is being funded by the German Federal Ministry of Economics and Energy (BMW) as part of the federal government›s 6th energy research program under the supervision of project sponsor Jülich. The research funding provided by the BMWi in the area of power grids is aimed primarily at advancing the grid infrastructure and developing it to accommodate the infeed of a large share of renewable energy. Siemens AG (Berlin and Munich) is active in more than 200 countries, focusing on the areas of electrification, automation and digitalisation.